Tom McDonald, left, carefully fits the new hybrid GSM-satellite transmitter on Otter, who is wearing a hood to keep him from biting. 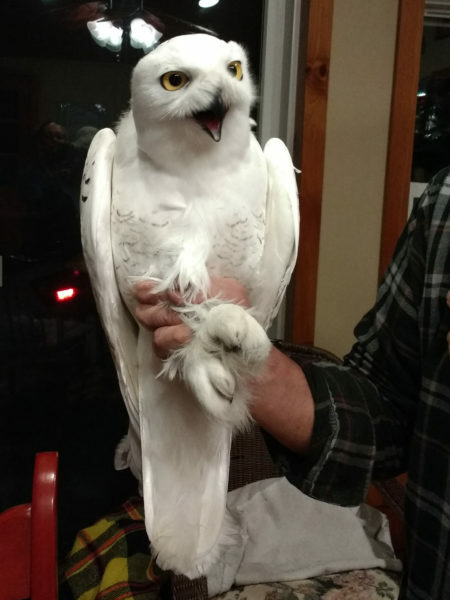 Working with snowy owls is rarely easy, but earlier this month Tom McDonald had a run of buzzard’s luck — including a trip to the ER — that would have stopped most people. It didn’t stop Tom, though, and as a result, we have our first-ever owl tagged with an exciting new generation of transmitter — one that will allow us to keep track of an owl year-round, anywhere in the world, without sacrificing the quality of data we’re already getting. Tom’s been banding snowy owls for more than 30 years, but he said this particular trip was one of the most difficult of his career. 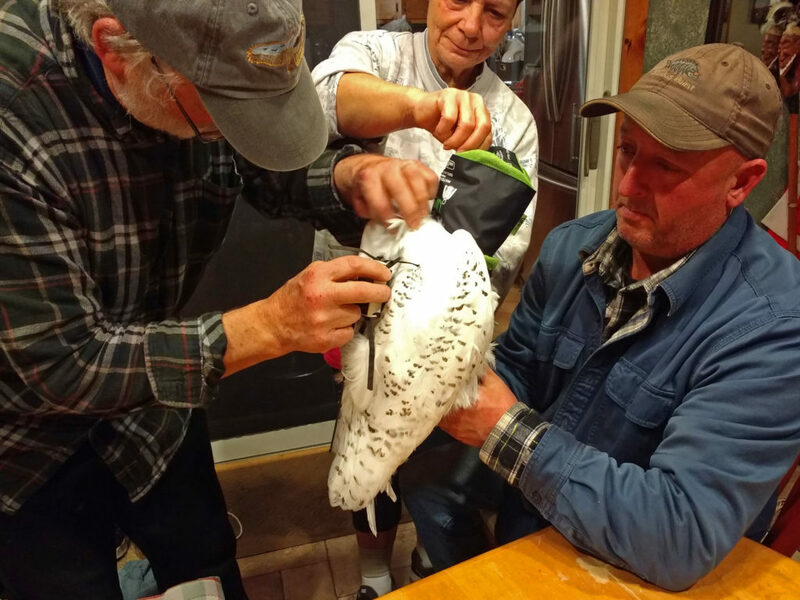 It should have been easier; Tom’s good friend and fellow raptor bander Dave Tetlow offered to chauffer him from Rochester to Tom’s main research area in Jefferson County, NY, close to the Canadian border, so they loaded up Dave’s van with trapping gear and headed east. Otter, a second-winter male caught Jan. 18 in upstate New York. By 6 a.m., with the temperature “a fairly balmy 28 degrees,” Tom said, they were in the town of Chaumont Bay at the eastern end of Lake Ontario, where a snowy had been reported. They quickly found the owl, silhouetted against the slightly lighter dawn sky, but also found that all three of Tom’s phai traps had been mangled when packed. (A phai trap has a lure cage in the middle surrounded by a lightweight hoop with nooses to catch the attacking owl’s feet.) Tom hurriedly fixed up one and dropped it for the owl, which made an attack, knocked the rig several feet and managed to evade the nooses — and was gone. “Things were about to go downhill from there,” Tom said. Over the coming hours they tried for six more snowies, all with no luck. One was scared off by a snow plow, another was chased away by a Cooper’s hawk (which ended up caught itself). Still another kept them waiting for 90 long minutes before simply flying away without a second look. An owl in a perfect spot — dead-end road, no traffic — turned out to have a neighbor, a second snowy that attacked the first, initiating a back-and-forth fight that took both owls far away. Retracing their steps, Tom and the crew found that original male from daybreak. “Since most of my phai traps were temporarily disabled, I shouldered my large bow net and headed for a secluded spot in the cemetery just off the main drag,” Tom said. “The couple inches of fresh snow that had fallen earlier in the day would be perfect for hiding the outline of my trap. Unfortunately, it was also perfectly hiding the patch of flat, and very slippery, ice.” Tom crashed to the ground with the heavy net, so badly bruised and banged up that he literally had to crawl the rest of the way to set up the bow. This owl proved to be no fool, and Tom suspects it may have been trapped before. “It managed to do everything but center itself in the trap. He hopped on the hamster cage and jumped back off. He would make a pass at the cage, kiss it and fly a short distance away. He walked all the way around the outside perimeter of the bow trap, turned and walked around in the other direction.” When, after what seemed an eternity, the owl was safely centered in the middle of the net, Tom tried activating the remote release, only to discover that the mechanism had jammed when he’d fallen. This owl, too, got away, and Tom was now in serious pain from his injuries, gulping pain meds to dull the aches. The new hybrid GSM-Argos transmitter will allow us to keep track of Otter wherever he goes, even when he’s in the Arctic. The transmitter that Otter’s wearing is something brand new, not just for SNOWstorm but wildlife telemetry as a whole — the world’s first hybrid GSM-Argos satellite transmitter from our colleagues at Cellular Tracking Technologies. The units we’ve been using for the past five years collect GPS locations and send them to us over the GSM cell network; that allows us to collect huge amounts of data at a very low cost. But it also means that when the owl is out of cell range, we don’t get any data until (or unless) the owl comes back into the cellular network. If the owl remains off the grid, we have no way of knowing where it is, and whether or not it’s alive. Otter’s transmitter, though, has a second channel for communication, through the Argos satellite system. When it’s out of cell range, we can program it to periodically send a small packet of data — a cluster of GPS points, accelerometer readings and a few other details — via satellite from anywhere in the world. That means that when Otter heads back to the Arctic, at regular intervals — maybe every two weeks — we’ll get a ping from him that will show very precisely where he is, and whether he’s been moving around or has been stationary for a prolonged period. At the same time, the GPS locations that his transmitter continues to take, regular as clockwork 24 hours a day — as in all our transmitters — will be stored in his memory bank. When he comes into cell range again, we’ll get that backlogged data in all its normal, extensive detail. But if he stays in the Arctic next winter, or comes south to an area where there is no cellular coverage, we’ll still be able to keep tabs on him. 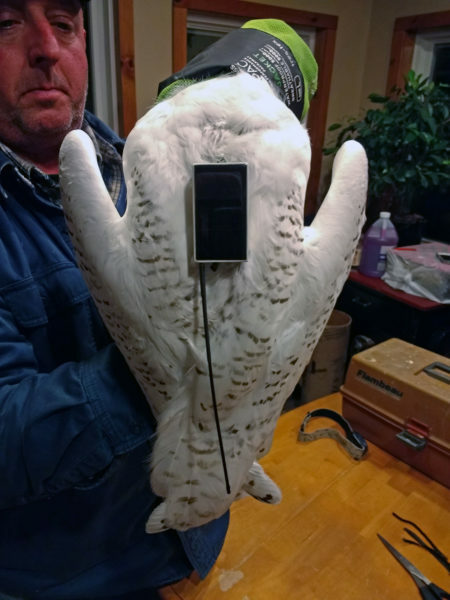 CTT is the only manufacturer making these hybrid GSM-Argos units, and Otter is the first owl — in fact, the first raptor of any sort and only the second species at all, after Canada geese — to carry one of these hybrid units. So while we’re sorry it was such a trial for Tom getting him tagged, we’re especially glad to welcome Otter to Project SNOWstorm– and look forward to tracking him year-round. I enjoy reading these updates; many thanks! Oh my, that is duty way and beyond. I’m thankful Tom is OK and grateful that he has the sticktoiveness to get that snowy! Don’t know if you’ve seen it, but I got a remarkable photo of a snowy coming in for a landing in front of a traffic camera in Canada. If you’re interested, let me know and I’ll send you the link. Tom and friends, thank you for keeping us on the edge of our seats! I live in Regina Beach Sask, We are able to see snowey’s most years about 50 miles south of here. Would appreciate your offer. Thank goodness for people like you guys. It is so wonderful to read about what you do and how you do it. Sorry about the bruises. Since i live in Syracuse, i am very familiar with this territory and read avidly the placenames!! boy, you guys are simply amazing in your steadfastness. Tom, you are a hero! thank you for being the greatest science/snowy guys anywhere. i love reading your blogs. I saw my first snowy owl in person this last Spring, truly a life list moment! I love seeing the up close photos of all the owls. Welcome to the family Otter! New technology, that’s very exciting, now we will be able to hear from him year round. Glad Tom was cleared from any broken bone after the ice mishap! Thanks for all your very dedicated work to the SNOWstorm team. I so enjoy these stories! That new hybrid transmitter looks so big on Otter! Does it interfere with the owl’s ability to maneuver or hunt? I know they are light weight and you are careful about weighing the birds. It would make it easier to spot Otter for sure. Looks like Otter has his own cell phone! Great question. The two big differences are a larger solar panel, which covers the entire surface of the unit instead of the rear two-thirds (which does make it look bigger) and the antenna, which is necessary for the Argos satellite capability. We asked Tom McDonald, who fitted Otter with this hybrid unit, for his impressions since he’s the first researcher to deploy one on a raptor of any sort. He replied, “The overall design of the hybrid is pretty consistent with what we have been using for the past few years and remains fairly easy to deploy on a snowy owl. The new antenna does not seem to interfere with the outfitting process and looks like it will not hamper the bird’s everyday activities. All in all, a pleasure to work with and deploy.” Because Tom’s been working with snowy owls for 30 years, that’s a strong vote of confidence. Thanks. Now to go out and spot one of these owls !